It was a clean crisp air that swirled around the truck as we gathered for our first parade in Nashville TN. 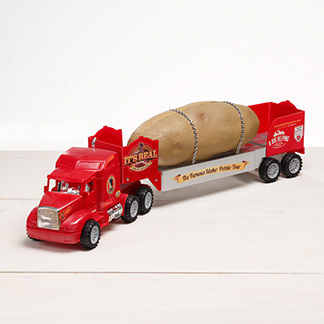 To see the potato truck on this special day was even more of a rare occurre nce since the majority of the time we don’t make the trek out of Idaho past October. The many people hustling and bustling around with an extra pep in their step made it feel more like the holidays were upon us. Parades are always some of my favorite events because it’s hard not to find a smiling face nearby. 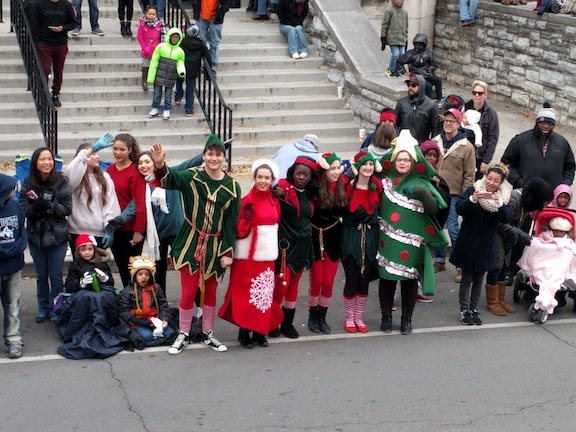 The energy level of a parade is very hard to match and people are always excited to see you! It’s the closest feeling I can associate with being extra famous. 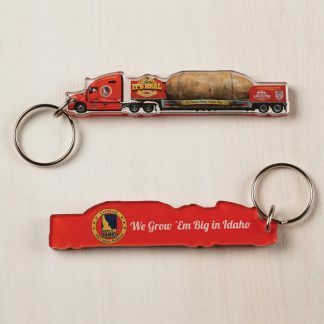 Walking near all of the spectacularly decorated floats with Christmas lights, sparkling garland, green luscious pine trees, and costumes galore I still knew our Big Idaho Potato ranks at the top of the flo ats. 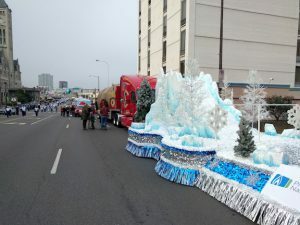 The added wreaths on our hood and all four chains was definitely eye candy for all of the parade onlookers. Now obviously the Spuds Studs… and Larry had to add to the fun by rocking our red felt Christmas hats and bringing the holiday dance tunes to town! We even had company to join us along for the ride as Stanley Trout, his wife, and two younger boys were honorary tater team members for the day. We began to get anxious as the clock chimed 9:00am and we knew that our number would be called soon. Bands began tuning into their jams and matching their steps as we reared to go. 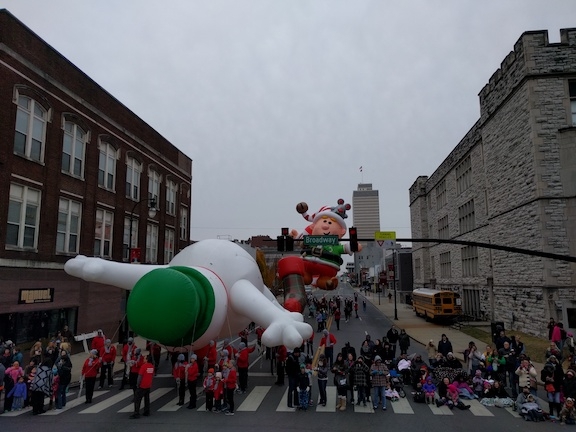 A few really fun floats began to pass us on the right as it was their turn to go. I think i even saw Chewbacca and Vader walk by. If you were quick you may have caught Ellis and I with our jaws dropped as the Titans cheerleaders passed by in their trolley. Larbear gave the universal two honk warning and we were off. otato that extra potatoee (it’s a word,I promise!) look. 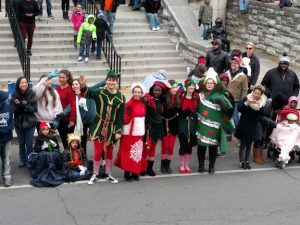 My secret of having the most fun in parades is to scan through the crowd and find the extra excited or chipper people and point to get their attention. You are guaranteed some interaction, fun banter, and long laughter if you take on this strategy. We rounded the corner at the end of broadway as Ellis hopped off to grab a magnificent shot of the potato with tall classic architecture in the background. The people slowly began to fade as we started to get further from the main street. Soon we came to a halting stop and just as fast as the parade started it was over. 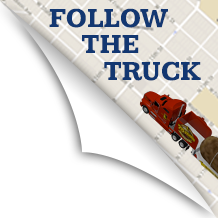 The magic of the truck is that the energy from the parade never dies. We roll along the streets, highways, and interstates as if we have an unannounced parade ongoing the entire tour! 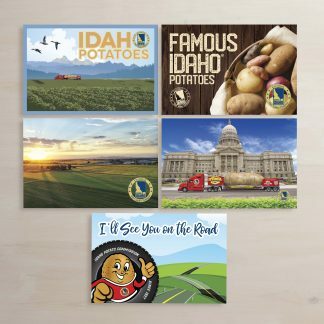 We call our parade, The Famous Idaho Potato Tour! So next time you see us don’t be afraid to grab our attention, smile, and take a photo!